Summary: To prevent war following a catastrophic change in the climate, an AI working for the UN instituted an ancient peace-keeping measure: all world leaders must submit a child to be held hostage. If war is declared, their children’s lives are forfeit. One such hostage is Greta, the Crown Princess of the Pan Polar Confederacy, whose world is turned upside down by the arrival of Elián, a hostage from the Cumberland Alliance. Will Greta and the other Children of Peace keep war at bay or will their parents sacrifice their own for the greater good. And what do goats have to do with it? 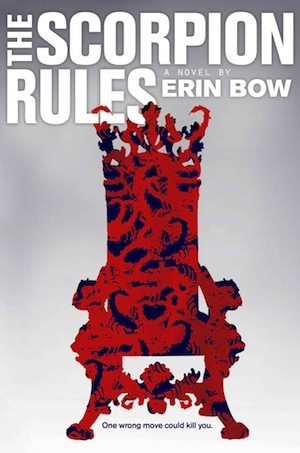 Before I begin I have to say that I really wanted to like The Scorpion Rules — and sometimes I even did — but as with a lot of concept novels that deal with dystopian worlds and child murder (see also Dualed and its sequel Divided), it just didn’t live up to its premise. The book begins as most dystopias do with an apocalypse, starting with the melting of the polar ice caps because yes Virginia, global warming is real. This rise in sea levels leads to a decrease in land, a loss of water and food, new diseases and plagues and a series of disputes calls the War Storms. As readers we are not shown but rather told these events by a former human now a Class II artificial intelligence named Talis, a sassy entity and lover of the Terminator films who saved humankind from the War Storms, holding all of humanity hostage with their own mortality. 400 years later, we are introduced to the Children of the Peace, child hostages who are meant to keep the world in a state of — you guessed it — peace. In order to rule, leaders must give up one heir as hostage, to be held in robot and cyborg monitored prisons called Preceptures. Should two countries decide to declare war, both their heirs will be terminated in the mysterious Grey Room. Perhaps due to their royal status or the way they were raised, none of the children are relate-able, and with the exception of the first few chapters (which had my hopes up so damn high) and a few in the middle, I had a really hard time caring whether anyone lived, died or was tortured with an apple press. The book itself starts off promising enough. Our apparent hero is seventh-generation hostage Greta Gustafsen Stewart, Duchess of Halifax and Crown Princess of the Pan Polar Confederacy — AKA, what’s left of Canada — who only has 16 months left until she comes of age and is released. Of course she is in constant fear of death. And let’s face it, a little boring and vanilla (and not french or bean either). Then the hostages start raising goats and bad boy/love interest/fellow hostage/most annoying teen ever Elián Palnik shows up referring to himself as Spartacus, robot spiders are introduced and the children started a cringe-worthy food fight and all hope is lost. Did I mention that the goats are named Flopsy, Mopsy, Topsy, Bat Brain and Dipshit? Because they definitely are. There are a lot of strange choices scattered throughout the story. For example, even though the world is overrun with cyborgs and giant robot scorpions, Talis forces citizens to ride around on horses and eschew air conditioning (unless you’re a royal of course) in order to better planet earth and prevent further destruction to the environment. This of course would be all well and good if a giant spaceship doesn’t appear when it suddenly becomes convenient. Another strange choice is to make former human Talis retain a level of sass that includes writing a book of quotations that humanity must obey if they want to prevent their overlord from blowing up populated cities — a book called the Utterances which includes phrases such as “Resistance is futile” and “Everybody, out of the pool!” Usually I would enjoy a petulant villain with a god complex, but Talis becomes too heavy handed once he appears outside of the prologue. Again, I really wanted to like The Scorpion Rules, the premise is intriguing and the cast of characters is incredibly diverse. Unfortunately, the story gave me nothing to chew on, the plot left me with little to care about and the characters left me rooting for no one. Have you finished The Scorpion Rules? Did you like the turn the end took? You should definitely read the much more intriguing Skinned trilogy by Robin Wasserman. It will make you think all the things about human consciousness. I appreciate the suggestion, I totally agree with your review!